The head of antiquities on Thursday unveiled restoration work under way at one Egypt's most famous synagogues, a project he denied was meant to assuage Jewish anger at the country's culture minister. Culture Minister Hosni Farouk, who is campaigning to be the next head of the UN office that promotes cultural diversity, outraged many Jews with his comments in April 2008 vowing to burn any Israeli books found in Egypt's famed Library of Alexandria. The Egyptian government has rallied around the 71-year-old culture minister, but the country's head of antiquities, Zahi Hawass, said the decision to restore the Moses Ben Maimon Synagogue in Cairo had nothing to do with Hosni's candidacy. "I believe these rumors were started to hurt Farouk Hosni's bid to become the next director general of UNESCO," said Hawass, who reports to the culture minister. "The Jewish monuments are Egyptian monuments ... they are part of us and part of our culture." The synagogue was named after Rabbi Moses Ben Maimon, a famous physician, philosopher and Torah scholar who was born in Cordoba, Spain, in 1135. He eventually moved to Cairo, where he died in 1204 and was buried inside the synagogue. The remains of the rabbi, who is known in the West as Moses Maimonides, were later transferred to the Holy Land. The synagogue was built in an area called Haret al-Yahoud, or "The Jewish Quarter," a reflection of how medieval Cairo was divided up into religious and ethnic neighborhoods. It was declared an antiquity in 1986 due to its historic architecture and religious importance, Hawass said. The area around the synagogue is now known as el-Gamalia. It used to be a slum filled with garbage-covered dirt streets until the government recently cleaned up the area to attract tourists. Hawass said the synagogue sustained serious damage over time from earthquakes and ground water. The restoration is part of a national project to refurbish ten Jewish synagogues across Egypt, he said. The synagogue is divided into three parts: an area dedicated to prayers and rituals, another for Ben Maimon's tomb and a third that included a women's prayer section. The restoration, which started in mid-June and is expected to last a year, includes a plan to rebuild the synagogue's heavily damaged walls and reconstruct the interior. Hawass showed reporters a restored wooden door from one of the synagogue's entryways, which was painted with a gold Star of David and topped with a carving of a date palm. 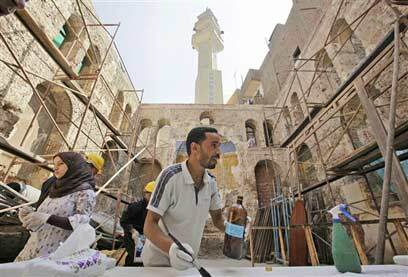 See all talkbacks "Egypt unveils restoration of famous synagogue"